Home » Blog » News » Another Successful Kickstarter, Thank You All! 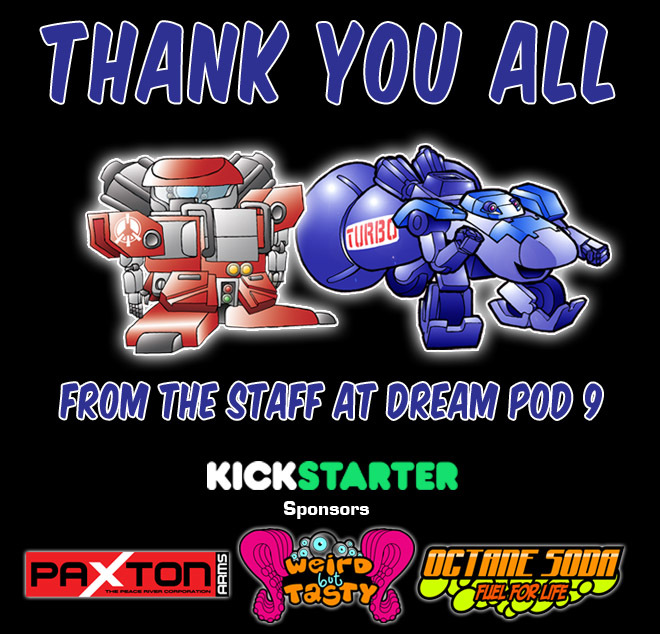 Thank you to all our amazing backers for your support of the Heavy Gear Blitz Peace River & NuCoal Core Plastic Miniatures Kickstarter. Your pledges raised $40,912 CAD, which gives us our initial funding goal of $25K for the first plastic injection mold and unlocked the first 6 Stretch Goals. Kickstarter will process all the pledges over the next 2 weeks and we’ll work on the Pledge Manager website to have it ready to send out invites to Backers soon after that. About a week after we email out invites to the Pledge Manager we plan to open it to outside Backers and start our extra funding campaign to get Stretch Goal 09 unlocked at $50K CAD and fund the second plastic injection mold. We’ll make updates when the invites go out and when the Pledge Manager is opened to outside Backers. Next: Post Kickstarter Update: NuCoal Arbalestier 3d Model for Pewter Mini Preview!